There were only just a few surprises in the Cubs’ minor-league system in April when it came to performance. 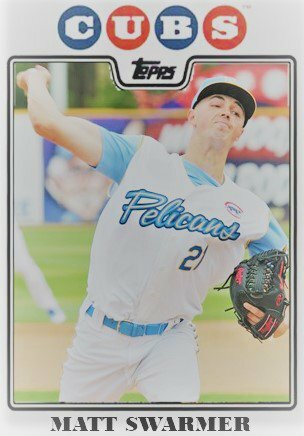 I thought that Tyler Thomas would be outstanding in a relief role; turns out he was outstanding as a starter in South Bend with an ERA of 1.42. However, it’s right-handed Myrtle Beach starter Matt Swarmer who has surprised everyone. In four starts, Swarmer posted a 1.74 ERA in 20.2 innings. He has walked only 3 while striking out 26. His strike count ratio is an astounding 80% and his K to walk ratio is 8.67 to 1. Those are spectacular numbers! S warmer was 6’5″ and 175 pounds when drafted out of Kutztown in 2016. He looked to be a collection of arms and legs that flew everywhere. 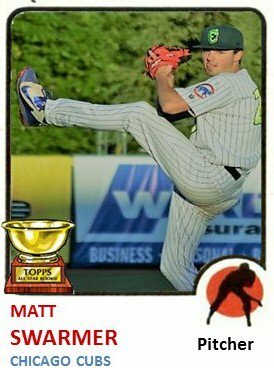 He originally had a Bronson Arroyo-like leg kick with an over the top delivery on a steep downward plane. In addition, Swarmer also had a looping curveball that showed some promise that first year at Eugene in 2016. The gangly 19th round pick from Kutztown bounced around a bit his first two years in the system. The key, however, was that he was not a fully developed prospect (and still isn’t). He still has the big league kick and the same delivery, but three key developments are changing how people are evaluating him and his arsenal in 2018. 1. In fall instructs in 2016, according to Arizona Phil, Swarmer learned a new changeup that he took to like a duck to water. Phil quipped that Swarmer became a must see pitcher for other arms in the system during batting practice. The pitch comes into the hitter with some fade between 80-82 usually. It has some sink to it. Its kind of weird. It looks like a fastball but acts like a 12 to 6 curve with its drop. I can see why that befuddles hitters. 2. In 2017, Swarmer bounced around the system playing for Eugene, South Bend, Tennessee, and Iowa. He took on a variety of pitching roles from to starter to piggyback to reliever to just spot starting for a pitcher skipping a start. He got over 100 innings in, but he wasn’t really developing anything but arm strength. Well, that arm strength is paying off in 2018. 3. His curveball looks to be a bit tighter and not as loopy. This has to be confusing as his changeup tends to drop off the table and down. His curve tends to go from 12 o’clock to 7. Whereas before it had a big arc. Now, it’s tighter with a harder break. 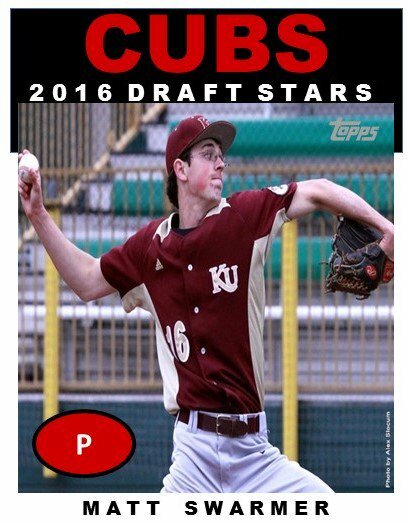 Scott Kornberg also added that the Cubs’ own scouts love Swarmer’s development. His high leg kick and over-the-top delivery just aid in hiding the changeup and developing fastball. Swarmer can still add a more muscle to his frame. I doubt he is much past 210 pounds now. I’ve seen two of his starts this year and he is not the same pitcher he was in 2016 when the ball leaves his hand. The swings he gets are ugly, whereas the results he’s getting are very promising. Sometimes the Cubs do select projects. Swarmer is one of those 27 pitchers from 2016 on whom they took a gamble. Swarmer’s success looks to be sustainable just based on his changeup and increased velocity. The separation between 94 and 80-82 is tremendous. For 2018, 20.2 innings does not seem like a lot to base an evaluation on, but there is a clear ascension pattern taking place. Will 24 more innings be enough? His development arc will take some time. I am excited to see what he can bring to the table as he starts to go around the Carolina League a second time. Then we will know if hitters adjust. Next ›The Friday Six Pack – What’s Up with Jose Albertos?